Or as low as $87.50 per month over 12 months. Apply Now. 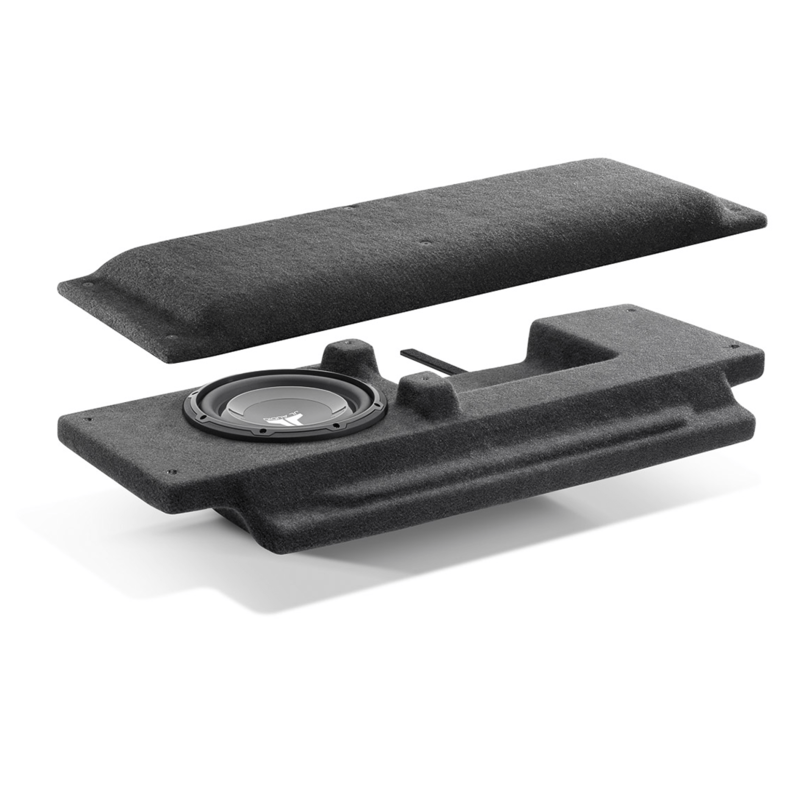 JL Audio SB-J-JK2DR/10W1v3/DG Stealthbox system sits inconspicuously on the cargo-area floor and features a rigid, carpet-covered, removable panel that conceals a powerful 10-inch subwoofer driver and a secure mounting place for a JL Audio amplifier (sold separately). The subwoofer driver is housed in a sealed, carpet-covered fiberglass enclosure. The entire structure is designed to be easily installed and removed when the tailgate is opened, so you can choose to remove it if you plan to get your Jeep really filthy or need the extra space. The original American off-road machine is made for getting dirty and finding places that nothing else with four wheels and four seats can reach, but it’s not really made for great bass. Let’s see what we can do about that. The Hard Data: Contains one 10W1v3-2 subwoofer in a sealed enclosure. 300 watt power handling. Wired for 2 ohm mono. Installs on floor of the rear cargo area. Floor of cargo area is raised approximately 5 inches with installation. JL Audio’s Miramar, Florida loudspeaker production facility is one of the most advanced in the world. Since most of our premium loudspeakers incorporate proprietary, patented technologies requiring specific assembly techniques, we find it is vital that the people who designed them have close access to the people manufacturing them. The following JL Audio products are built in our Miramar, Florida factory, with global components.